a very fun part of the weekend for me was following the speakers on twitter and facebook from my phone! they were posting from the event, hotel, dinner, cabs, it was so fun! and a few of my friends and i were posting to each other too (only on breaks of course!) :) it was a very technologically connected thing, which comforted us since none of us brought laptops (and that's very hard for digital scrapbookers)! the theme was a grand new day, and it sure felt like it! the women of faith worship team was energizing, besides great, and i thoroughly enjoyed singing and worshiping my rear off (can you do that?) though i would have loved to sing a lot more. 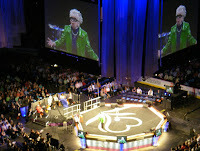 singing with 17,000 women rocks! and oh the music! 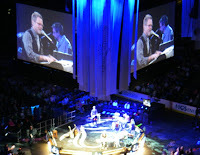 steven curtis chapman, how could that not be amazing? great singer of course, great songs of course, i'm sure you can sing them all, but he seems like such a great husband and father too. you've probably heard of his young daughter maria that he lost last year, so to hear him sing cinderella was just a killer. as an adoptive parent too of course i feel like i have an inside connection to his family, but there weren't many there who took that song in stride! it was good, in a heart-wrenching way, and you could see how much his family was depending on God. mandisa was awesome and had us all dancing! she did a great diana ross, and tina turner, and whitney houston. of course my deliverer was great to hear/see/sing live! and she has such a great story (great on this side of it anyway) that makes the powerful words of her songs even more meaningful. and it was very cool to hear about some of her experiences on american idol, especially with simon! goodness, all that, plus great books, bags, necklaces, lunch outside on a GORGEOUS day, and being surrounded the whole time by a GREAT group of girls was just an awesome weekend for me! here's our whole group at the cheesecake factory (i highly recommend the adam's peanut butter cup fudge ripple cheesecake!). 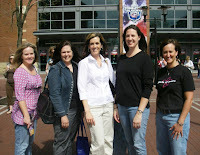 10 of us stayed with debi's gracious sister-in-law jodi friday, which was so much fun with all the girls! we had some great snacks (pms dessert is so yummy and so fitting for a house full of women! ), and great conversations, and not much, but great sleep. I was there too! Wasn't it fabulous! !